Baroness O’Loan’s Conscientious Objection (Medical Activities) Bill, which is currently progressing through the House of Lords, will ensure conscience rights for all medical professionals. You can help support the Bill by taking two-minutes to contact your MP and ask them to take action and support the Conscientious Objection (Medical Activities) Bill. I would like to be kept up to date with Free Conscience's projects (We will not share your data and you can unsubscribe at any time). For more information please read our Privacy Statement. Existing law fails to protect some medical professionals from unjust discrimination. An Inquiry in 2016 found that some doctors and nurses report facing discrimination in their work lives due to their conscientious objection to practices that they believe end a human life. This can include the withdrawal of food and fluid from a dying patient in end of life care. Pharmacy professionals were recently threatened with guidelines that would compel them to be involved in provision of abortifacient or contragestive drugs. The conscience rights of midwives were undermined by a 2014 Supreme Court judgment, which held that the conscience provision in the Abortion Act 1967 did not cover their work. The current reality in law and medical practice means that in practice, certain areas of healthcare, and certain medical specialisms, such as obstetrics and gynaecology, are more difficult to access and progress in for those with particular moral, philosophical and religious views. Midwives, in particular, are vulnerable to discrimination and professional disadvantage. As this intensifies, more areas could be affected. This violates the human rights of healthcare workers, and the principle of an open, liberal, and pluralistic society. The Conscientious Objection (Medical Activities) Bill will clarify the law by offering statutory conscience protection to all medical professionals to protect them from discrimination, enabling them to participate in their chosen professions and deliver the best care to their patients. Article 9 of the European Convention of Human Rights states that, “Everyone has the right to freedom of thought, conscience and religion; this right includes freedom to… manifest […] religion or belief, in worship, teaching, practice and observance”, and this has been held by the European Court of Human Rights to cover rights of conscientious objection, in cases such as Bayatyan v. Armenia (2011). This includes controversial areas such as contragestion, abortion, and the withdrawal of life-sustaining treatment. Section 10 of the the Equality Act 2010 protects against discrimination on the basis of religious or philosophical belief. Inclusion of all sections of society is a fundamental principle of equality legislation and the anti-discrimination provisions it contains, and this necessitates allowing people to ‘manifest belief’ by reasonably accommodating their conscientious ethical views. GPs, as well as many nurses, midwives, pharmacists, and other medical professionals, have limited statutory conscience protection. As a result, some areas of healthcare practice are becoming increasingly inhospitable for those with certain deeply-held moral, philosophical and religious views. Not only is this discriminatory; it means a less diverse healthcare professions will become increasingly less diverse, inclusive, and representative of the views of the general population. A recent ComRes poll found that 56% of the public oppose forcing doctors to have to participate in abortion procedures against their will, if they want to remain in their profession, with less than half of that number (22%) supporting it. Fit-for-purpose conscience rights will protect healthcare professionals from the moral injury that is caused when people are forced to act in ways that seriously violate their deeply-held ethical beliefs. Research has shown that individuals in these circumstances suffer a range of harms, including burnout, exhaustion, guilt, anxiety, loss of self-esteem, and ‘moral distress’ – and that many professionals ‘deaden’ their consciences in order to cope. This kind of moral disengagement has serious implications for patients as well as for the physical, mental and emotional health of healthcare professionals themselves. Trust and integrity are central to healthy relationships between healthcare professionals and their patients. When professional conscience is respected and protected appropriately, patients can have confidence that the individuals who are involved in their care are individuals who are able to work in a way that maintains and promotes their moral integrity. The role of the healthcare professional is about more than technical skill and clinical expertise; professionals working in healthcare need to make ethical, not just clinical judgments on a day-to-day basis. Trying to keep conscience out of healthcare practice is not only impossible, but undesirable; it damages the professional AS a professional, which is damaging not only for the professional, but for any patient who needs to rely on them. Conscience law is designed to protect people from being morally implicated from in an activity that they regard as seriously immoral. The statutory provisions we have at the moment only cover a narrow range of health professionals (those with a ‘hand-on’ role in the abortion process) and leaves many others vulnerable to violations of conscience (eg nurses, midwives and GPs whose roles although crucial are more ‘indirect’). So we need more robust protections that will protect all those at risk of sharing a moral responsibility for outcomes they regard as morally prohibited. 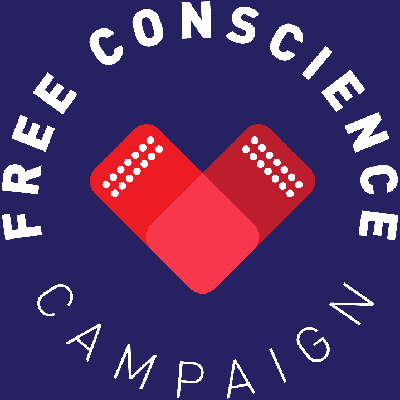 We are a campaign set-up to support freedom of conscience in healthcare and Baroness O’Loan’s Conscientious Objection (Medical Activities) Bill which is currently progressing through the House of Lords. Our spokespeople are Mary Doogan, one of the two midwives in the Greater Glasgow Health Board v Doogan & Anor (2014) case and Dr Mary Neal, who is a leading conscience expert and a senior lecturer at Strathclyde University. For media or any other inquiries please email info@freeconscience.org.uk.